I took this photo just 2 days before I wrote this poem. It was in the early afternoon. The sun was high in the sky behind clouds overhead. 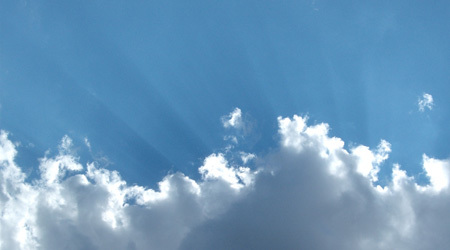 In the Scriptures, we find that clouds are associated with the Glory of God. You'll see why I chose this photo when you read this poem for Pastor Appreciation Day. The title of this poem for Pastor Appreciation Day - "The Very Best Pastor Appreciation", may seem surprising. When you read it, you'll discover why it fits. The word pastor comes from a Latin word meaning shepherd. The best pastor of all is Jesus, who said, "I am the Good Shepherd." No one knows your pastor's heart and what he truly needs better than the Good Shepherd. The place of happy rest. Recite some poetry with charm. When angels sing in harmony. The biggest of His graces. The banquet of the Master. You work with zeal and zest. A place for you, dear friend.